Home » What are the best Lucky 15 Betting Promotions? What Are The Best Lucky 15 Betting Promotions? One of the best things about placing a Lucky 15 bet is that if you are careful about which bookmaker you place the bet with, you can qualify for an additional bonus whether you land one winner, or all four of your selections. To help you decide where is best to place your next Lucky 15 bet, we have searched through the top bookies to find out which are offering punters a promotion or offer or some other kind of bonus for Lucky 15 bets. If you are more concerned with getting value on a single selection winning for you with your Lucky 15 bet and generating enough money to perhaps cover the bet, or even make a small profit, then you should check out the offer from Betfred. While Betfred also offer a percentage payout on top of your winnings for picking four winners from your four selections, what is equally interesting for punters (and more likely to be useful more often) is the fact that they will pay out on a single winner, at three times the stated odds. So, let’s say for example, only one of your four selections comes in at 5/1 and you placed a £1 unit stake on that bet when placing your Lucky 15 bet. With Betfred, you will be paid out at 15/1 for that bet, meaning that you would receive back a return of £16, including your stake (all bonus winnings are paid in real cash). This means that you would actually make a £1 profit on the Lucky 15 bet, even though you landed just a single winner. *Offer applies to any horse racing, greyhound racing, virtual horse racing and virtual greyhound racing bets only. Note: They’ll also pay 4x the odds on just one winner in any Lucky 31 and 5x the odds on just one winner in any Lucky 63 bet. In addition to the above bonus Betfred are also running a win bonus for all Lucky 15 bets which get four out of four selections correct. 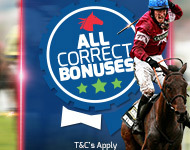 Any lucky 15 bet that wins all legs at Betfred gets a 10% win bonus added on top of the total returns. So if you’re Lucky 15 paid out £300 in regular winnings you’d also bag yourself a £30 bonus on top of that. Bonuses are paid on winnings only, not stakes, and are credited as real money not bonus funds (which is very nice for a change). Note: you can also get a 10% win bonus on all Yankee’s, a 20% win bonus on all Lucky 31/Canadian bets and a 25% bonus on all Lucky 63/Heinz wagers. Where Did All The Other Offers Go? If you’ve visited this page in the past you’ll remember that Ladbrokes, Coral, William Hill and Betvictor all used to offer this promotion as well as Betfred. There was also a double odds on one winner deal available with Sky Bet as well as a 10% win bonus on top and a double odds one winner + 15% win bonus from Bet365. All of the above offers have been pulled… it’s hard to pin point exactly why but the main reason is the majority of companies have turned their attention towards football betting and are using acca insurance offers to attract new customers as opposed to Lucky 15 bets which are traditionally more associated with horse racing. If this situation changes and any offers are reinstated or new offers released we will update the page accordingly but for now Betfred are quite an easy choice for anyone looking to place lucky 15 bets.